If you purchased a PC or Laptop/Notebook within the last 2 years (maybe triple that time for a Mac), most likely it has what's called an EFI/UEFI BIOS which boots-up your Windows® 10 (or Mac OSX) from a GPT partitoned disk drive or SSD (or M.2 or even an NVMe/PCI-e storage device). And that UEFI (Unified Extensible Firmware Interface) BIOS will use data in a GPT (GUID Partition Table) partitioned drive's second (2nd; LBA 1) sector, without even checking the contents of its first (1st; LBA 0) sector! However, to prevent various tools and operating systems from overwriting critical data (or even whole partitions) on a GPT partitioned drive, its first sector is given a "Protective Partition Table" with an assigned partition type of: EE. You'll find all the details about such a partition entry and how to read a GPT on our page here: GPT. 1. MbrFix - Many useful tasks! 2. Sector Inspector - Even works with Windows 10 GPT Partitioned Disks! Note: These Two Tools are very out-dated; we recommend using the Windows XP BOOT.INI file, Windows 7 or 8 BOOTMGR or various GRUB Boot Managers for most OSs today. 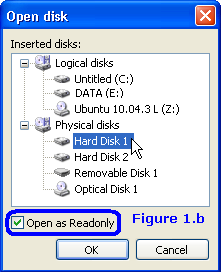 Use HxD's "Extras" menu to open Disks as "Logical" or "Physical"
(to see/edit the MBR and other sectors outside Logical volumes). There's an Ubuntu CD in its optical drive (assigned the letter 'Z:'). 'Hard Disk 2' had no readable volumes and 'E:' was a USB drive. NEW(!) Step-by-step Tutorial for saving MBR, VBR and hundreds of sectors of disk drives to files. You may also wish to see our Hex Editor page for other pictures (and a Tutorial which makes use of HxD to provide an image file of MS-DOS 1.10). 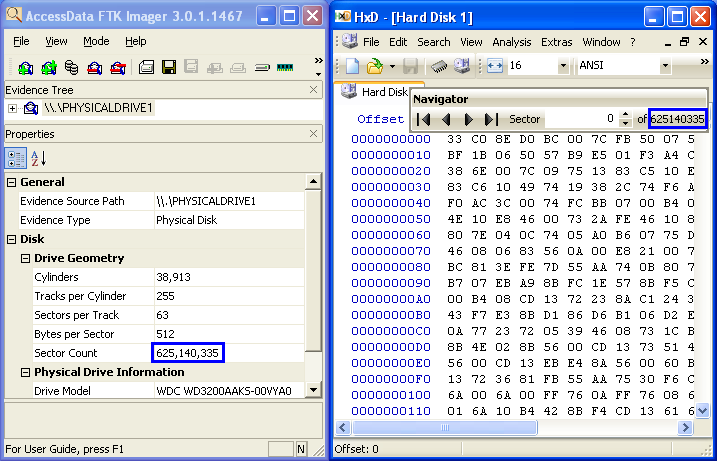 HxD is a Hex Editor for editing either binary files or hard disk sectors from within Windows! This makes it the first FREE Disk Editor that can do many of the things people purchase a commercial editor like WinHex for! HxD continues to be improved by its author, who is still interested in any bugs you might possibly find and open to suggestions! HxD already has all the basic features you need: Both Hex and ASCII (including Unicode) search and replace, and it will open files, memory locations, hard drives (as either logical or physical) and disk image files too! Note: If you need to edit a disk drive under DOS or a version of Windows prior to XP, PTS-DE is a very useful tool on a DOS boot diskette; especially if your computer won't boot up, but being only a 16-bit DOS tool it can not be used under Windows 2000 or later! Their original FTP site no longer exists, because they were bought out by Symantec Corp. in December, 2003. One of our readers recently (AUG 2016) informed us that it's still possible to occasionally find a Symantec support rep making use of some of these utilities; such as the one found here: https://support.symantec.com/en_US/article.TECH93277.html. Read the whole page and you'll be able to obtain the old PQ "MBRUTILD.exe" (for DOS) and MBRUtil.exe (for Win2k/Win XP) from there. Get a FREE set of Windows tools by PowerQuest from the Symantec FTP site for displaying and editing your Partition Tables and Boot Records... my page here will show you which files to download: The links are no longer any good! 1. 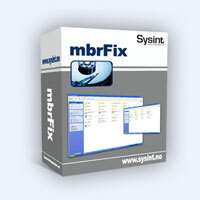 MBRFIX.EXE 1.3.0.0 (Author: Kåre Smith; of Systemintegrasjon AS; for Windows™ NT/2000, XP, 2003, Vista and Windows 7). This links to a very nice page describing all the program's commands. Kåre has not only made sure you cannot easily mess things up when all you want to do is save or restore your MBR sector, but he's also added lots of extras (more than 'fixmbr'; and there's even a 64-bit version)! MBRFix can be downloaded here. Please read: My verification of MbrFix's 'fixmbr' command; various other commands, and a listing of the program's usage display. Apart from MbrFix's "savembr" and "restorembr" commands, it has many other useful commands, such as: "driveinfo" and "listpartitions". The command "fixmbr" writes the MBR code for Windows XP to the first sector of the specified disk without changing the partition table; just like Microsoft's Recovery Console. REM  1st disk drive (drive 0 under MBRFIX.exe). REM  REMOVE MY NAME and edit these notes! echo  MBRFIX.bat for it to run. echo  Press any key to close this window. 2. Sector Inspector. This Microsoft® Windows Tool will still function under Windows 10 (as well as Win 2000, XP, 2003, Vista, 7 and 8) systems; even under the newer UEFI/EFI systems with GPT partitioned disks! Very useful (and somewhat easier to use than Svend's 32-bit "FINDPART getsect" utility for Windows). You can dump any range of sectors in either text or binary forms and write those files back to any disk! MS Download Page for Sector Inspector, or search for "Sector Inspector" elsewhere on their site. NOTE: The file secinspect.exe is all you really need and it's only 32KiB (32,768 bytes). If you install the free archive program 7-zip on your PC, you'll be able to open Sector Inspector's .msi install file (yes, 7-zip opens .MSI and many other types of files!) and extract only the executable and .chm Help file from inside Sector Inspector's .msi file; without having to first install it. Performing backup of sector range. Sector Inspector is attempting to lock the volume \\.\PhysicalDrive0. Backing up requested sector range. 1 of 1 sectors were backed up. If you look inside the included secinspect.chm HELP file, you'll see on the "Backing up a sector range" page a WARNING message; we assume Microsoft included this dire warning only to let you know that you could be overwriting critical information on the same disk you are reading from? Generate a standard report that includes a complete hex dump. Generate Report with no hex dump information. Dump a sector range using 64 bit LBN. Dump a sector range using Cylinder, Head, Sector notation. Dump a file in hex. Save a sector range as a binary .DSK file. Restore a sector range from a binary .DSK file. It's important to note that Sector Inspector only interprets whatever data it finds in media it can read from. It does not check if any of the data is consistent or accurate. Technicians using this tool are responsible for checking the consistency of the data found in the boot sector. For example, we recently connected an 8 GB USB 'thumb drive' to a PC, ran Sector Inspector, and discovered it does not distinguish between media formatted as floppy diskettes (the first sector being a Volume Boot Record) and drives with an MBR and Partition Table. So the data it presented as an MBR "partition table" was completely false, since the drive didn't even have an MBR sector! In other words: Sector Inspector expects you will only be checking disk drives which have an MBR (Master Boot Record) in the first sector of the disk, and that there are no problems with its Partition Table! This is still a very good tool for gathering byte-level data from a drive, but don't expect it to do all the thinking for you! REM  then display the file in NOTEPAD. echo  Press any key to continue searching for it. REM  So let's look for it there too! echo  location in order for this batch file to work. If you want Sector Inspector to print the data without showing all the hex bytes in the MBR and VBR sectors, just add the switch "-n" like this: "secinspect.exe -n >> SIout.txt". Most Windows computers do not have a way to include choices in their Batch programs; if you have a copy of MS-DOS 6 or Windows 95/98/98SE, a program called CHOICE.COM would allow this. Using CHIOCE, you could create a more advanced Batch program that would give you a choice of how to print out the data; which commands to run! 4. ZAP63.zip (just 3kb) is an Assembly program which uses INT13 to 'zero-out' every byte of the first 63 sectors of any hard drive you choose. (MD5 sum of older version; v 1.3 = 1f78bd078613b771fc5f00075e89dfd1). This program is based on the original 'ZAP' utility (which wiped-out 128 sectors; too many sectors in our opinion! So, we made this 63-sector wipe-out version instead). It's ideal for quickly zeroing-out the MBR plus the next 62 sectors; which may contain old boot overlays, managers or possibly viruses. NOTE: Your computer may contain some valuable information in the sectors between the MBR (first one on the disk) and first VBR (Volume Boot Record) sector, such as computer HDD IDs, so examine (e.g., using HxD) and save them before using this utility! For those who really want to 'start all over again' though, we recommend spending the time to 'zero-out' every byte of the whole disk with a program from the disk drive's manufacturer. By doing so, you may fix some "bad sectors" while carrying out the whole process! For more info on HDD-wiping, see: our WIPE page. A couple of my first Batch Utils: (13 JAN 2002). Basically, it saves the MBR as either an exact binary file (mymbr.bin) or a text file in the same folder it's run in. Since Windows doesn't allow DEBUG (nor many other programs for that matter!) to see your MBR ( not even under real DOS 7.1), this batch file runs a small INT13h Assembly program in DEBUG which can access the MBR. MyMBR has a Menu system which gives you a choice of Displaying the results onscreen, Saving the display to a text file and viewing that file, saving the MBR as a Binary backup, Erasing the two files or Exiting the program. Logic was added to make sure MyMBR never overwrites any existing copies of the saved files. CopyMBR.zip (just 2kb; a more simplified version of MyMBR) is a DEBUG script file controlled by a Batch file which only copies the first sector of your hard drive as a binary file; this can be very useful in troubleshooting any boot-up problems you have, or for restoring a corrupt MBR/Partition Table at a later date. [ Requires DEBUG.EXE to be in the PATH of a working hard drive, or on an MS-DOS or WINDOWS 9x boot disk. 25 SEP 2001. If you need an easy Disk Editor to make manual changes to your Partition Tables, take this link to my FreeTools review page about the PhysTechSoft-Disk Editor (PTS-DE); if you still use boot floppies under DOS, this is a great tool. What if you need to make small but detailed changes (such as changing the NT Disk ID bytes) to system areas on the OS boot drive of your PC and do not have any other PC or bootable disk drive to connect it to as a "slave drive"? Answer: You use a bootable CD/DVD; such as an Ubuntu Live CD/DVD! TestDisk (Version 6.13; November 15, 2011). Check out the latest features at the website! IMPORTANT FEATURE: As of v6.5, TestDisk can now COPY any file (or recurse through whole subfolders) from within a "lost partition" without having to first restore and reboot the computer; ideal for someone who forgot to save some data before deleting a partition and for some odd reason, you still can't access the partition any other way. We strongly advise you to first run this tool on known good drives, without using any of its write functions while first learning how to use it. If possible, you may also wish to use some discarded drive(s) for experiments in testing all of its features! When you are fully confident in how to use TD, recovery operations should be less of a hassle. Choose from many precompiled executables: TestDisk can run under all Windows and DOS (such as after booting up with a Win98 Boot Disk with the DPMI server program; CWSDPMI.EXE that's included in the download), or Linux (there's a static version you can use under almost any Linux OS) operating systems. There's a binary for MAC OS X (10.x) too! and XFS (SGI's Journaled FS). This is a revision of a free program we saw at Power Quest (before they ceased to exist). 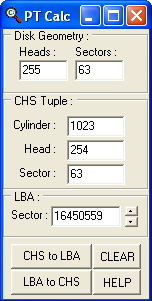 It will help you check if both the CHS Tuples and the LBA Sector numbers found in a Partition Table match. Although CHS Tuples in an actual MBR sector are limited to 1023,254,63 (see our page on Partition Tables for a detailed explanation), this program allows you to calculate the pseudo CHS vales for LBA Sector numbers up to their 32-bit limit (a 4-byte Double Word; see Note 4 on our page 6 to 64 Bits concerning bit sized limits.) That gives us a possible Absolute Sector of 4,294,967,295 (or a CHS equivalent of 267,350 Cylinders, 90 Heads and 4 Sectors; CHS Tuple: 267349,89,4). 3 TB hard disks became available some time ago. That's far beyond this 32-bit limit (which is reached at less than 2.2 TB). To use the full capacity of a 3 TB disk, you may need to upgrade your BIOS, install a 64-bit OS or do both. We would recommend reading about the new GPT/EFI boot partitions ( GUID Partition Table) before you consider purchasing a 2.2+ TB disk for your PC. If you're seeking info specifically for the Windows™ Vista or Windows™ 7 operating systems for use on multi-booting disks, we suggest visiting Multibooter's here: http://www.multibooters.co.uk/. If a commercial company desired to have a PC workstation boot into more than one OS, they often turned to commercial software such as: System Commander 2000 by V Communications, Partition Magic by PowerQuest (Note: If you want to purchase Partition Magic 8.01, sorry, but Symantec discontinued selling it: "Due to changing consumer usage trends and Symantec's desire to offer the highest quality and most innovative solutions for the latest operating systems, Symantec has discontinued Norton Partition Magic 8.0. "), Acronis OS Selector (previously Boot Wizard), which is now only a portion of their Acronis Disk Director 11 program or OSL2000 by osloader.com to replace their standard MBRs. If you're running a Linux OS on the system, using GRUB or LILO are viable alternatives as are the BOOT.INI file from an existing Windows NT/2000/XP OS, or BOOTMGR and BCDEDIT with a Windows™ 7 OS install. NOTE: The easiest way to try out, say, Ubuntu Linux version 10.04 LTS (Lucid Lynx), or later, on a Basic MBR, ordinary Win7 PC (i.e., the disk is not encrypted; no TPM hardware in use), is to use the built-in SHRINK capabilities of the Windows 7 "Disk Management" utility to shrink the size of your Main Windows partition (NOTE: It must be the last partition on the disk drive! CAUTION: A number of 'brand name' PCs have extra partitions added by the PC manufacturer which can cause all sorts of difficulties for those attempting such tasks!) to create, say, at least 25 GB of un-partitioned free space at the end of the disk for Linux to install into. But before doing so, be sure to make a copy of your Windows 7 MBR sector. You may contact us for further assistance. For those who don't require much support, there are FREE programs, including an interactive MBR which can be obtained from Mikhail Ranish: the Ranish Partition Manager and Boot Manager http://www.ranish.com/part/. Download the stable freeware version 2.37.12 (which includes source code), or try his latest program. Ranish's program, part.exe (in version 2.37.12 or part_cmd.exe in the newer beta set), is also 'Console' enabled which means it can be used rather effectively in Batch files too! For the details, open a DOS-Window at the folder where part.exe exists, then enter: part -? at the prompt (do NOT use -h as this is a command to HIDE partitions!!). http://www.ranish.com/part/xosl.htm; you'll find a link there to the author's own web site. Most of the data on these pages are the result of my own testing using various versions of FDISK on real working hard drives which were methodically examined in detail with various disk editors and other utility software. Detailed listing of almost every different type of partition that has ever been used on a PC. ( I do however wish that he'd used a different font for the 'identifiers' rather than the same lower-case letters as his text! ) His second page (titled: Properties of partition tables) may be confusing to many (including the way some terms are used), but it does contain some real problems people have had with different OSs (section 2.8) and large drives (section 2.7) as various bugs or limits have been encountered in the course of our ever increasing hard disk sizes! NOTE: We have our own simplified List of Partition Table Types here! Updated: November 18, 2007 (18.11.2007); August 3, 2009 (03.08.2009); August 9, 2009 (09.08.2009); August 11, 2009 (11.08.2009); January 30, 2011 (30.01.2011); May 8, 2011 (08.05.2011); May 22, 2011 (22.05.2011); November 26, 2011 (26.11.2011); March 29, 2012 (29.03.2012); April 15, 2012 (15.04.2012); May 19, 2012 (19.05.2012); March 28, 2013 (28.03.2013); April 26, 2015 (26.04.2015); June 21, 2015 (21.06.2015); August 25, 2016 (25.08.2016); February 1, 2017 (01.02.2017).